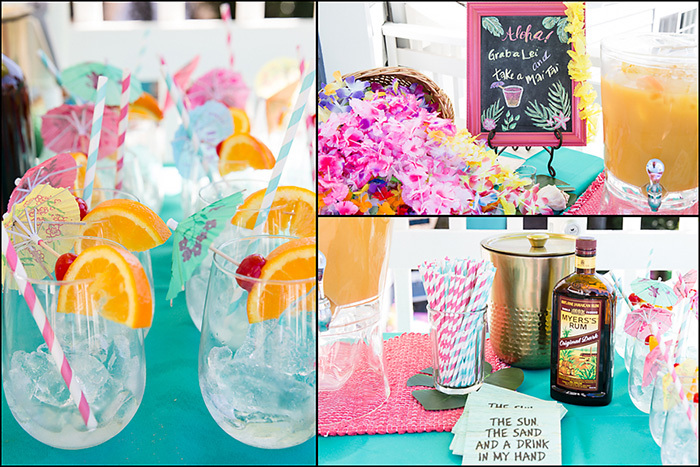 I had so much fun hosting this Aloha Themed Wedding Shower! And how blessed am I that it was for a beautiful young lady that I’ve known since she was five years old! I love her family with all my heart and was truly honored to host a couples wedding shower for her and her fiancé. I absolutely love the details of hosting a party! Everything from the food & drink, table settings, invitations, and decor. Every detail is so much fun to plan! 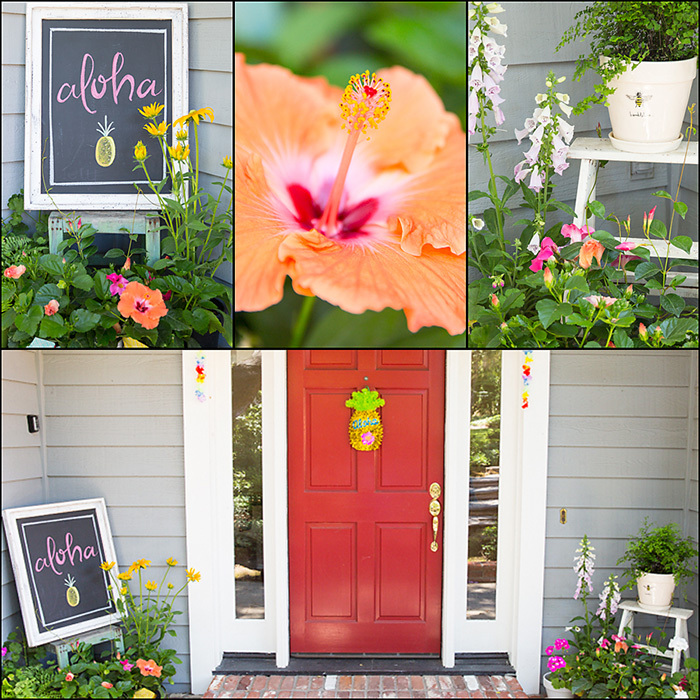 I like my guests to feel welcome from the first minute they arrive at our house, which means that my front porch always needs a slight theming and a bit of decor! And seriously, how amazing is this chalkboard? I wish I could take credit for the artwork, but guess who did it?? 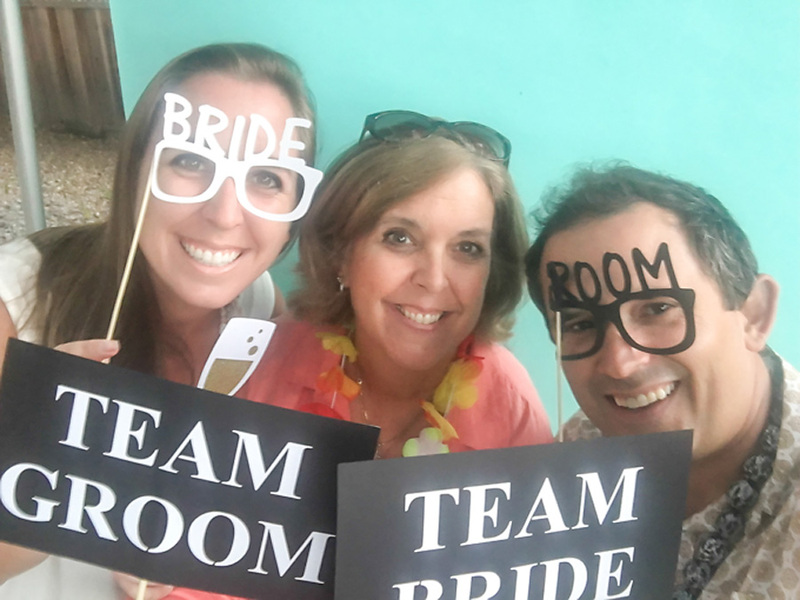 The Bride-to-Be! Yep, she’s my chalkboard artist! Check out some of the other fantastic boards that she’s done for me in the past. 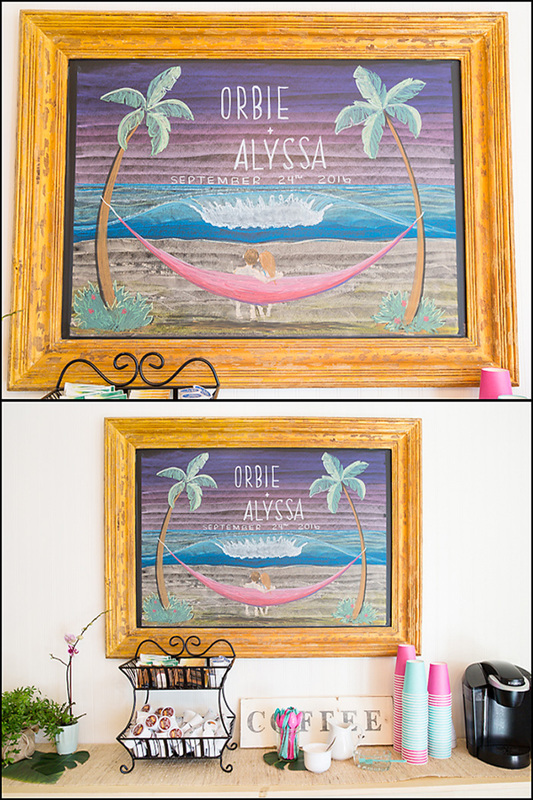 Here’s a post I did that you might enjoy, 7 Simple Party Planning Tips, that not only is full of great party planning tips, but it also shows a few more of Alyssa’s chalkboards. The chalkboard itself was purchased at Pottery Barn years ago as a frame. When we moved into our current home three years ago, I knew that I had the perfect spot for it. I ordered a school grade chalkboard and attached it to the back of the frame. It now hangs above a long buffet that I always use for beverage service when I host parties. Directly across from the buffet and chalkboard is my kitchen dining area. 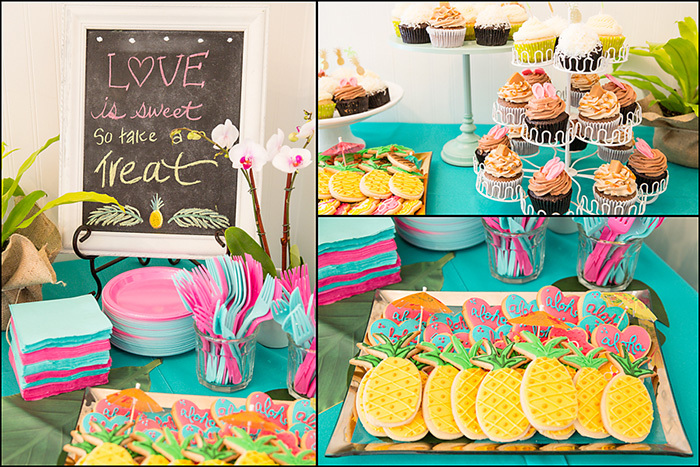 Although this Aloha Themed Wedding Shower was a backyard party, I decided, because of the heat to set the desserts up indoors. I ordered the cupcakes from a local cupcake shop, and boy were they ever delicious! 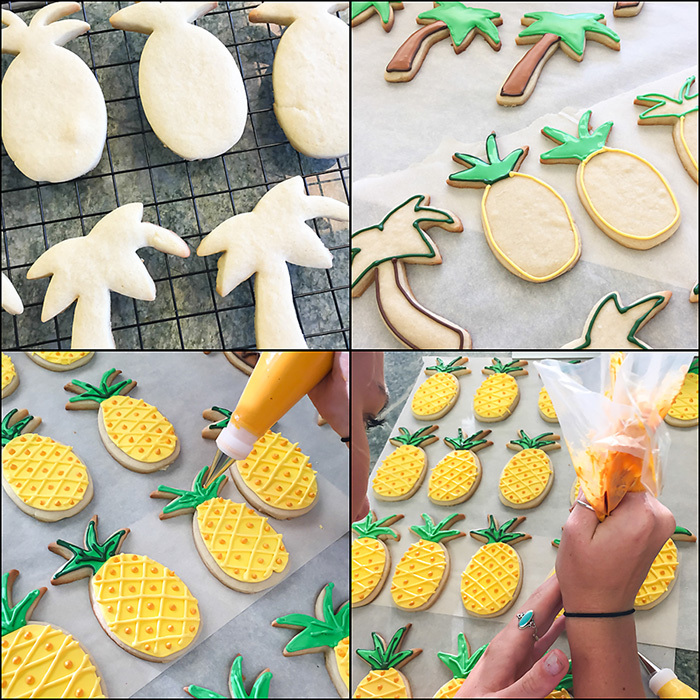 The cookies, shaped as pineapples, palm trees, hearts, and hibiscus flowers were made by yours truly 🙂 And my niece, I couldn’t do my cookies without the help of Addy! Not pictured were fruit tarts and also tropical fruit popsicles in a glass of bubbly champagne. A set of french doors leads you right outside to our back deck. It’s here where I set up drinks and food. Again, once outside our guests were welcomed with a Lei and a Mai-Tai. Here’s a few detail shots of the food table along with the table set up down on the lower lawn. It’s hard to tell by the pictures, but I opted to keep the table center pieces simple. They were simply a candle set in sand and some shells. 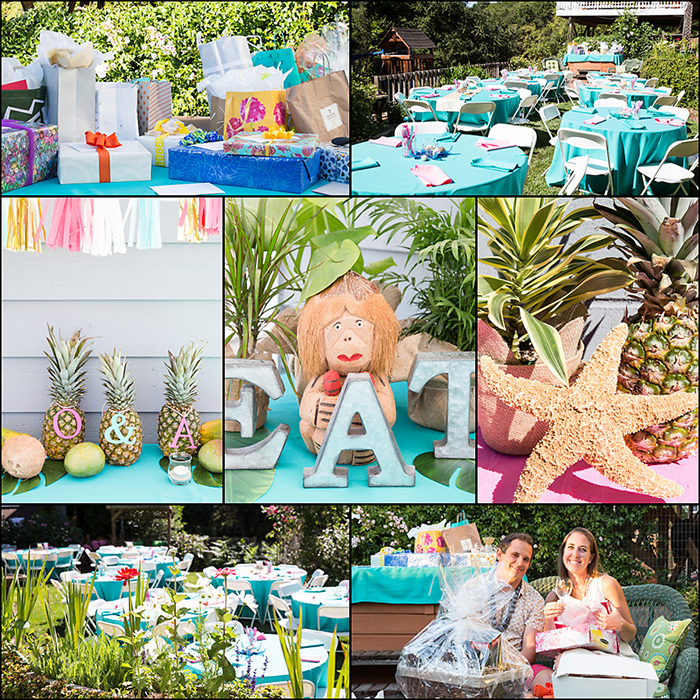 The food table is where I had fun, using fresh tropical fruits and plants, along with shells, candles, and of course some fun E A T letters and Mr. Coconut Monkey Man. I’m kicking myself now, but I don’t have any pictures of the food I served. What kind of food blogger am I? Seriously, not one picture. Let me tell you about it though, because it turned out pretty darn amazing if I may say so myself. For appetizers, I served Coconut shrimp (thank you Sheri), and Grilled Sausage & Pineapple Kabobs, and of course set out a couple bags of Hawaiian Chips (Sweet Maui Onion and Luau BBQ). The main course was Grilled Teriyaki Chicken, Pulled Pork Sliders w/Mango Coleslaw, Blackened Salmon w/Mango Avocado Salsa, Pineapple Rice, Caesar Salad, Macaroni Salad (thank you Grammy & Jeri), and Tropical Fruit Salad. And then of course, we served dessert! All 75 of our guests left with full tummies! 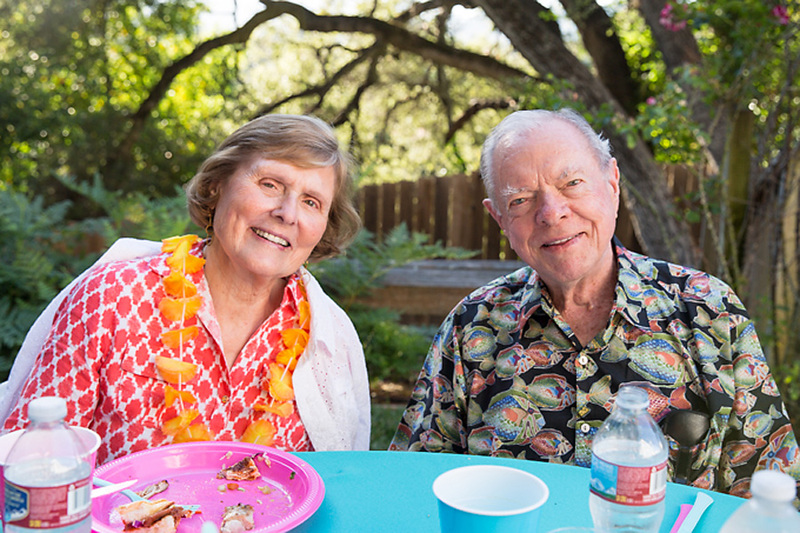 Talking about guests, what an honor it was to have Grammy & Papa at our Aloha Themed Wedding Shower!! I’ve known this wonderful couple since I was a little girl and I love them to pieces! We always say that if you look up “class and style” in the dictionary, you’d see their picture. When I grow up I hope to be as full of grace as my sweet dear friend Norma! 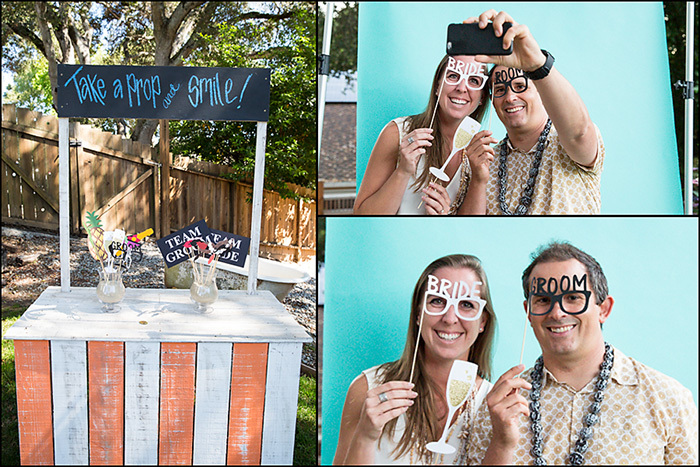 And what fun is a party without a photo booth? 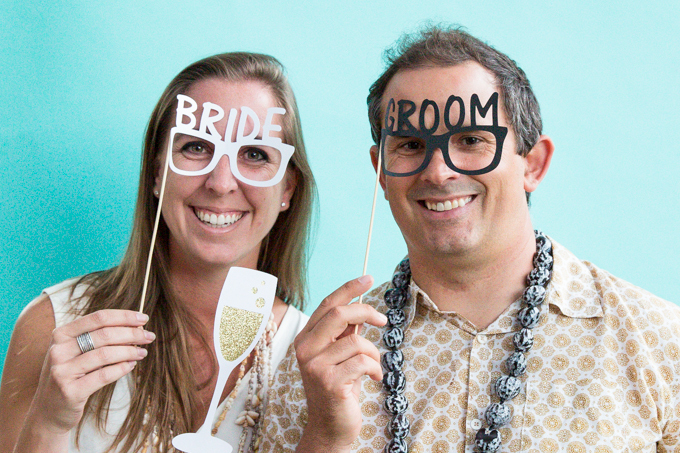 I dare say this crazy engaged couple had fun with it! I wish now that I had all the phone pics that their friends were taking throughout the party! Need I say, it was a hit! I even managed to get in a pic with Alyssa & Orbie! If you’re interested in making your own Frosted Sugar Cookies, check out my post HERE! 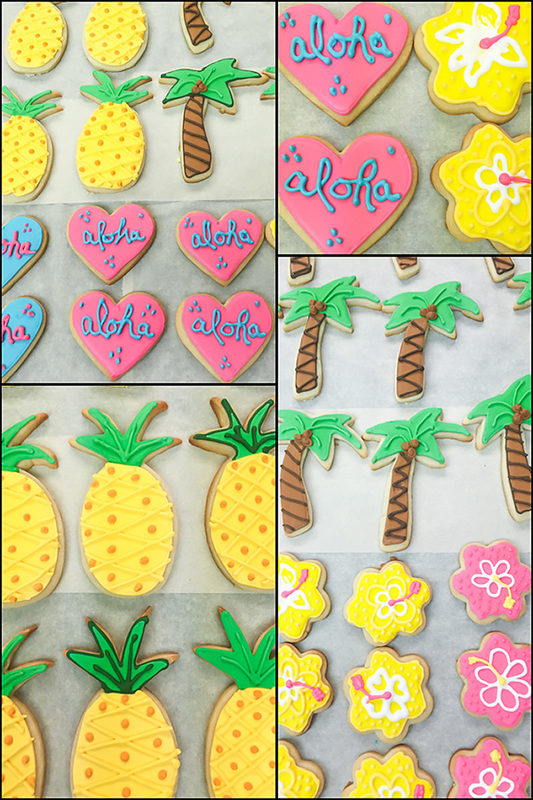 And just to tease you a bit more, here’s a few more pictures of the Aloha Themed Cookies! We’re not perfect at this by any means, but making and decorating cookies is SO MUCH FUN!! Above shows a little of the step by step process. The frosting is made in two consistencies, piping and flood. You start by piping the outline, then use the thinner flood frosting to fill it in. Once the frosting sets, you can do your decorating.